When the list of "worst Christmas songs" was released, there were several songs I expected to be on it. Paul McCartney's overly-sythesized Wonderful Christmas Time is one I'd expect. 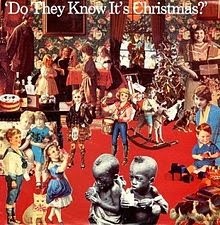 I also would expect John Lennon's Happy Xmas, with Yoko Ono wailing off key in the background, to be on the list. But that wouldn't be right, since the song is about world peace. I remember trying to talk my mom into buying the single because it was, after all, for charity. You know, kids in Africa or something. Those were probably my exact words. For the record, some of the top artists in England (British music was huge worldwide at the time) recorded the song to raise money for anti-poverty efforts in Ethiopia. All season, I've been turning up the radio every time Do They Know It's Christmas? comes on. I've been singing at the top of my lungs. I've been thinking it's the best. Christmas. Song. EVER. Only to find out that not only does HLN think it's the worst Christmas song...the man who wrote the song and masterminded the whole event hates it, too. As he told London's Daily Mail, "I am responsible for two of the worst songs in history. One is Do They Know It's Christmas? and the other is We Are the World." The problem with both songs, it appears, is that they are both overplayed and poorly written. At the time, nobody really cared that the song said "no rain nor rivers flow" in Africa...despite the fact that both exist in abundance. Nobody cared that the lyrics tended toward "hokey" throughout the song, with silly sentiments like: "Throw your arms around the world at Christmastime."